Cupcakes 'n Daisies: More Setler's Trail Updates . . . I've finished all the Block B blocks for Settler's Trail. I need 42 of these blocks. And I've got a pretty good start on them. Once these blocks are done, I'm done with the block making portion of this project. I had the nicest time visiting my daughter in California for Mothers Day weekend, I hope you had a wonderful weekend too! While my daughter and I were out and about we checked out the latest thing in cupcake sales, a Cupcake ATM! 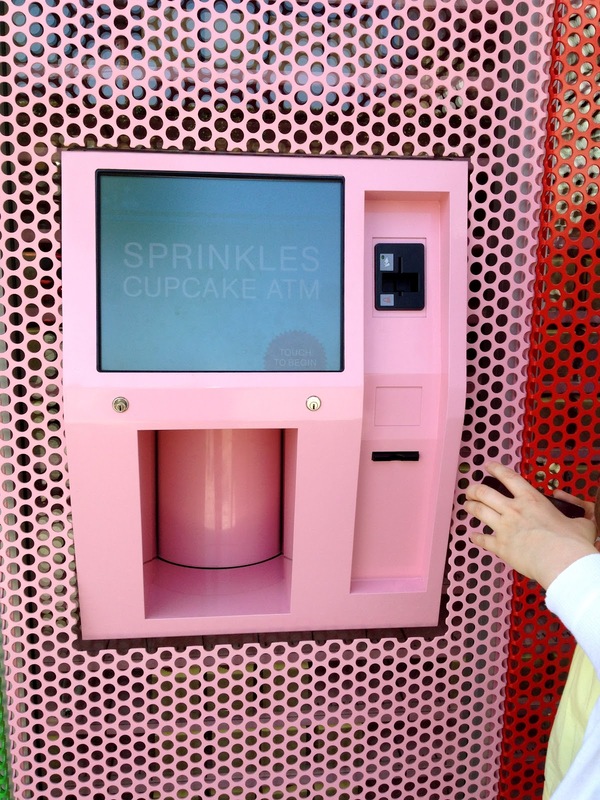 Sprinkles Cupcakes in Beverly Hills has installed what they call a Cupcake ATM. It was unveiled in March of this year. You walk up to the machine, select your cupcake, insert your credit card, and look what pops out . . .
Can you imagine having access to Sprinkles cupcakes 24 hours a day??? I don't have access to any good cupcakes where I live any time of day!!! When the machine first opened the line for the machine was longer than the line for the store! They sell around 1000 cupcakes out of this machine daily. The selection was great and the cupcakes were as fresh as the ones sold in the store. You could only buy one at a time, which made for a slow process, but definitely fun and worth the wait. I think I would have named it an ACM (Automated Cupcake Machine), but I guess folks understand ATM. So far the only Sprinkles Cupcake ATM is in Beverly Hills, but the next one to be opened will be in New York. I wonder how long it will take them to open one here, in the middle of nowhere? Thanks so much for all the great 100th quilt suggestions! In the back of my mind I was thinking a Double Wedding Ring should be on my list and that was the most popular suggestion. I agree with Lesley's comment when it comes to Double Wedding Ring quilts, they keep coming up with better and easier ideas on how to make one, maybe if we wait long enough, it will make itself! A Baltimore Album quilt was also a popular suggestion, maybe I'll think about that one for my 200th quilt! I've got the log cabin quilts covered, I think a quilter could spend a lifetime making nothing but log cabin quilts. A two color quilt, Dresden Plate, Grandmother's Flower Garden and a Lone Star quilt were also mentioned more than once, all quilt projects that had not occurred to me, I agree, they need to be on my radar. The comments that were along the lines of, "the hundredth quilt should show how accomplished the quilter has become" and "whatever makes you happy or your heart sing" describe exactly what I want my 100th quilt to be. I think it would be amazing if I could design my own pattern for my 100th quilt, so I'm giving that some thought, one with 100 blocks would be better yet. But as of now, I haven't made up my mind, stay tuned for updates. Julie in Wa is the winner of the Pat Sloan book, thanks to all who entered! !